Following independence from Great Britain in 1957, Nkrumah’s resource rich nation set out to make it’s mark in African Soccerdom. Inspired by Marcus Garvey’s Pan-Africanist writings, a goal was set to unite Africa. Football was one means of achieving that goal. A man with a sense for the times, Nkrumah was well aware Africa needed a stronger voice in international institutions. It was as true for the UN as it was for FIFA. In order to give more power to African involvement in football, Nkrumah wanted to boost African football in the international sports scene and gain global recognition of Africa’s new dawn. 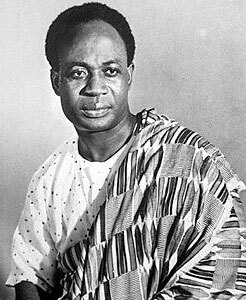 Nkrumah’s Ghana was the first Sub-Saharan African state to gain independence in 1957 but they were not the last. The next decade, characterized by British PM Harold MacMillan as the “winds of change”, would see the majority of African states gain their independence. Nkrumah wanted Ghana and Ghanaian sports to be at the forefront of this revolutionary time. Soon after independence, Nkrumah secured FIFA affiliation in 1958. Nkrumah wasn’t the only African leader at this time seeking to change African football. Initially he was catching up with others. In 1957, the Confederation of African Football (CAF) was established by Egypt, Ethiopia, South Africa and Sudan. The CAF’s main goal was the organization of an African Cup of Nations. As Europe had the European Championship and South America had the Copa America, the CAF thought it only right that African football had its own tournament. After the first African Cup of Nations was held in 1957, Nkrumah became interested in affiliating with the CAF. A shrewd politician, Kwame was well aware of the unifying power that football has and soon after 1957, Nkrumah began to look for ways to incorporate his brand of Pan-Africanism with African football. Unfortunately for Kwame it was a very slow process. The CAF was in its initial stages and the day-to-day organization needed for the general upkeep of the body took up most of its efforts. Hope came however in 1963, when a decision was made to create an African Clubs Championship. Sensing an opportunity, Nkrumah got behind the project. In 1964, Nkrumah donated 250 guineas for the creation of the African Clubs Championship. The CAF was grateful for the sum, which effectively bankrolled the tournament. Nkrumah soon became a thorn in FIFA’s side. For the 1966 World Cup held in England, FIFA allocated one qualifying place for both the CAF and the AFC (the Asian Football Confederation). Prior to this, African and Asian teams had to play in a play-off match against a European team to gain a place at the World Cup. The old system was becoming increasingly unfair and FIFA had hoped that one qualifying place would be enough to gain favor amongst the newly independent African and Asian States. One place wasn’t enough for Nkrumah and others in Africa. Soon a boycott was arranged for all African teams regarding the FIFA World Cup. It was a stunning show of unity from the continent and one that it is difficult to predict happening again. FIFA, perhaps caught off guard, eventually relented. The Pan-Africanist boycott had succeeded. For the 1970 World Cup one qualifying place was given to Africa and one to Asia. Each continent’s influence at the games has grown as the decades progressed. The 1966 boycott was Nkrumah’s finest moment in the football realm but it also marked a change in the Pan-Africanist’s fortunes. Whilst the first steps of the boycott were taking place, there was growing discontent at home regarding Kwame’s authoritarian rule . Football too was at the heart of this story. Soon after coming to power, Kwame, along with Ohene Djan, one of the most influential organisers in African football, created a Ghanaian football league in 1958 to improve the standard of Ghana’s athletes. The desire to improve Ghana’s football drove the men to unpopular measures. In the early 1960s a new ‘superclub’ was created called Real Republikans (a name inspired by Real Madrid, then the most dominant team in Europe). Two of the best players from every existing club in Ghana were transferred to Real Republikans with the idea being that this would improve the overall standard of the national team. Real Republikans were treated like royalty. 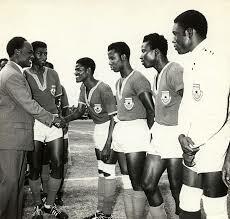 Players had unlimited access with Nkrumah and had their every wish granted. They played against other teams like Accra Heart of Oaks and Asante Kotoko in league matches but it was done on a non-scoring basis. This wasn’t to last. In 1964 Real Republikans were allowed to compete outright in Ghana’s football league and coolly strolled to the title. They were too strong for the teams in Ghana’s domestic league. Unsurprisingly this angered the fans of the other teams in Ghana but many accepted it had to be done in the name of nationalism. 10 players from Real Republikans were starting members of Ghana’s first team. In 1963, Ghana won the African Cup of Nations and any annoyance at Kwame’s Real Republikans was forgotten. When Ghana won the African Cup of Nations once more in 1965, Nkrumah perhaps felt vindicated in his actions. His foreign policy of Pan-Africanism was taking off and his football team was helping him. Pride always comes before the fall and all that. The other Ghanaian teams were still none too pleased with this arrangement but the theme of African nationalism was a pervasive and they accepted it. The Black Stars had almost all Real Republikan players but their popularity was non-existent. In 1966, Real Republikans transfer policies led to the disbandment of the Ghanaian League. No longer happy with losing their best players to Kwame’s ‘superclub’, other club in Ghana’s domestic competition bandied together and boycotted the League. The League collapsed and football fans were furious. Many complained he was authoritarian, socialist and wielded too much power. They weren’t the only ones discontent with the regime. Many of Kwame’s internal actions regarding football were symptomatic of his wider policies at home. Discontent reached a fever pitch in 1966, and just ten weeks after the African Cup of Nations victory, Dr. Nkrumah was ousted in a military coup. Real Republikans were disbanded by the new military regime and Ghanaian football went into a relative period of decline. Kwame Nkrumah had an ambitious dream to unify all of Africa. He saw football as a tool for achieving this dream. Internationally Nkrumah did much for the development of the African Game. He helped to fund the African Club Championship and was pivotal in the 1966 World Cup Boycott. Sadly his domestic policies in sport and elsewhere were to be his undoing. Ultimately Kwame failed in his quest for African unity. Football was both his tool and his undoing. The beautiful game yields a lot of power, especially in Africa. Where can I get more information on this story?? Many thanks for getting in touch. Paul Darby’s 2002 work entitled ‘Africa, Football and Fifa: Politics, Colonialism and Resistance’ should have exactly what you’re looking after.